The city of Cusco is not only characterized by its history, culture, architecture and tradition, but also by its people, who do their utmost to offer the best of their city to its tourists. This is why they have constructed lovely restaurants, they mold marvelous handicrafts and souvenirs, they prepare themselves to be the best guides and offer services in nature sports such as Natura Vive. Natura Vive offers natural adventures to all visitors that arrive in Cusco. One of these adventure sports is zip-line or canopy, that allows all those who want to practice it to fly over the lovely Cusco landscape of Valle Sagrado de los Incas (Sacred valley of the Incas), in a very secure and fun manner. 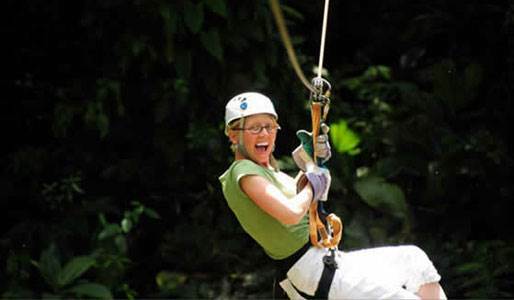 Zip-line or canopy -also called flying fox, zip wire, death slide, tyrolean crossing or aerial runway-, is an unforgettable experience. Through a pulley suspended by 6 cables of 100 to 500 m (for a total of 2000 m), located at an inclination, people hook themselves to the cable through a pulley fixed to a harness and are pulled by gravity, sliding from the upper region to the lower and losing more and more velocity as they get to the final part of the cable. Canopy is performed in Pachar, located between Urubamba and Ollantaytambo, and its difficulty level is minimal, which is why everybody, starting from the age of 6, can do it. The security equipment consists of a harness, pulley, belt, 3 musketoons, helmet, gloves and a via ferrata set. Remember that the minimum of people to perform canopy is 2 people and the maximum is 15; furthermore, reservations should be made with anticipation. If you are interested by this new experience, do not forget to use a light rope and safe shoes (no sandals); it is preferable to use pants and not shorts, also carry a backpack with 1 liter of water, at least. Departure from Cusco 7:30 a.m.
Departure from Valle Sagrado – 8:00 a.m.
*The departure time for private groups depends on their availability.